The exclusive upholstery collection of Lauritzon´s is extensive and versatile. Most of the textiles are produced in Italy and Belgium and Lauritzon´s put big emphasis on the design, the colour setting and coordination, and on the quality of the fabric. In order to sustain the own look and feeling of Lauritzon´s, the colours, structures, materials, and patterns are created and chosen in Lauritzon´s own studio, in cooperation with the European fabric manufacturers. The interior fabrics of Lauritzon´s are sold by most interior and furniture shops in Finland, but as well in many shops in Sweden and Estonia. Lauritzon´s has a close relationship with the different segments on the market, from the industry to reupholsters and architects. A fact is that many people actually are sitting on furniture dressed in Lauritzon´s fabric, without knowing about it. 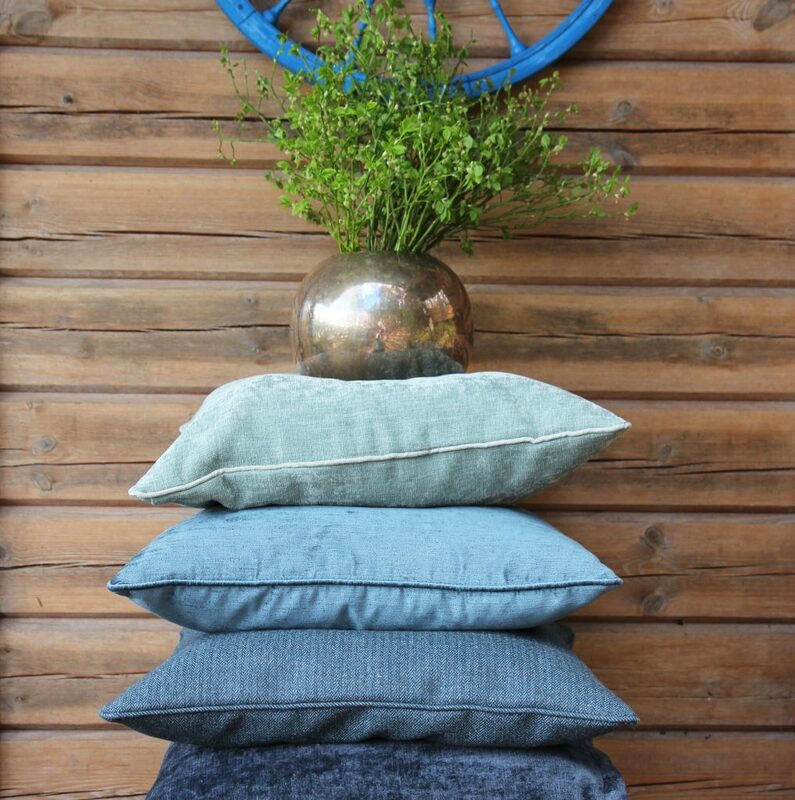 Lauritzon’s cushion covers in wonderful blue shades. The textile editor Lauritzon´s was founded in 1911 by the reupholster master Christian Wilhelm Lauritzon. He started his career as an apprentice in a reupholster workshop in Skåne, Sweden. As Christian got badly treated by the director of the workshop, he wrote a letter to the Swedish king. In the returning letter from the court the director was requested to treat the young man, which had a distinguished way of verbally expressing himself, in a good way. Later on Christian opened his own shop in Stockholm and started business in Estonia as well. In the end he got married in Finland, got his own family, and started a reupholster workshop and furniture store in Helsinki, Finland. With time the business developed and in the 1920s and 1930s the company also manufactured furniture. In 1959, Lauritzon´s introduced the wall-to-wall carpets in Finland and in the 1970s they completed many interior design projects for cruise- and other ships, hotels and shops. 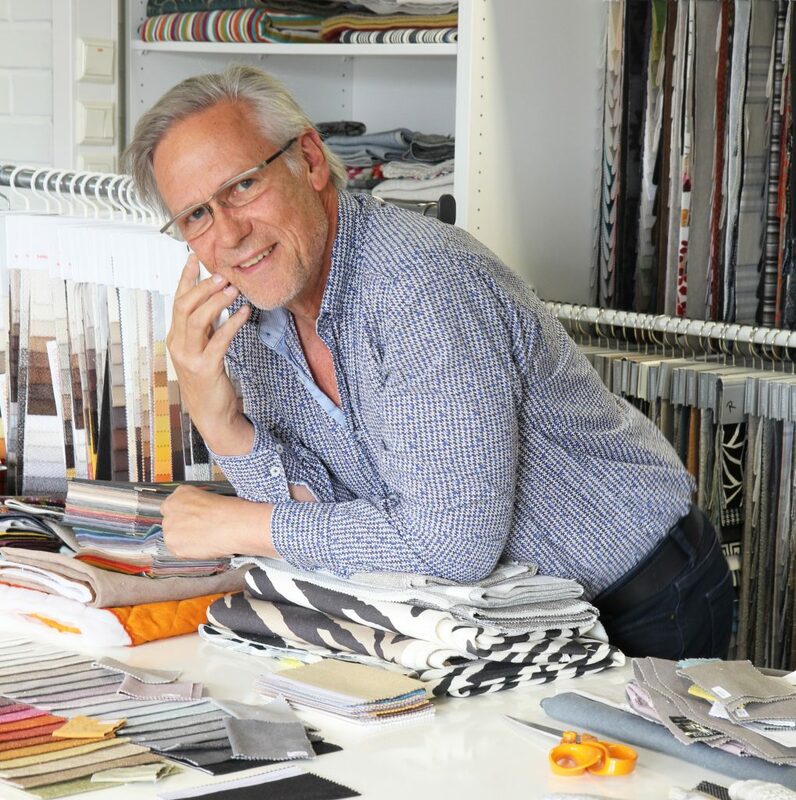 In the 1980s Christian’s son, Sture Lauritzon, started the business in interior textiles. The present CEO, Roland “Rolle” Lauritzon, has during the years created the own collection of Lauritzon´s, the brand name Lauritzon´s, and the retailer network in Finland and other countries like Sweden and Estonia. Today the company employs around 23 persons and the fourth generation, Corinne and Linus Lauritzon, are continuing in the company. Please book a time beforehand by contacting Tiina.